Enjoy the luxuriant flavors of hearty ground beef in a rich sauce, entwined with fettuccine pasta. The narrow design of the packaging allows the Fettuccine Bolognese to fit easily in even a crowded freezer. Each package is 260g and arrives frozen. 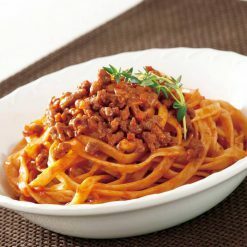 Bolognese sauce refers to a dish from the Bologna region of Italy, and in Japan is called meat sauce. It is a rich sauce that can be eaten with a wide range of pastas. 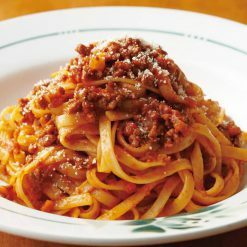 In Japan, the word Bolognese can also refer to pasta (spaghetti) with meat sauce. Fettuccine is a type of flat pasta originating in Italy. This dish also includes hearty ground beef. Our Fettuccine Bolognese is quick and easy to prepare. It can be cooked by microwave or by boiling, without removing it from its bag. The narrow design of the packaging also allows the Fettuccine Bolognese to fit with no trouble in even a crowded freezer. To microwave: Place the Fettuccine Bolognese (still frozen, still in its bag) in the microwave, with the side of the bag that has the steam vent facing up. Do not cut any additional holes in the bag. Approximate cooking times: Cook 1 bag for 4 minutes 30 seconds in either a 500W or 600W microwave. To boil in bag: Place the Fettuccine Bolognese (still frozen, still in its bag) in an ample quantity of boiling water. Cook for about 9 minutes.When microwaving: Cooking times will vary depending on the model of microwave. Please adjust accordingly. When boiling in bag: If the bag touches the rim of the pot, or if the bag is sticking out or hanging out of the pot, the bag can melt and develop holes. Please boil with care. Will be very hot after cooking. Please use caution to avoid burns. 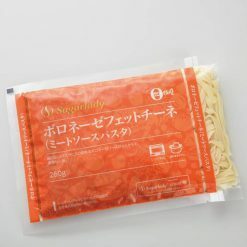 This product contains fettuccine, beef, vegetables (onions, carrots), tomato paste, beef tallow, sugar, butter roux (wheat flour, butter), table salt, soy sauce, cream, potato starch, grated garlic, pork extract, natural cheese, spices (black pepper, laurel, celery seed), yeast extract, caramel colorants, plant lecithin (from soybeans), xanthan gum.. Origin of ingredients: beef (Australia), onions (domestic). Prepared and packaged in Japan.